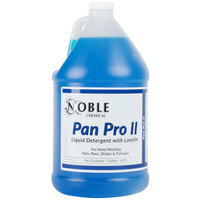 Keep your cookware clean with Noble Chemical Pan Pro II pot and pan detergent. 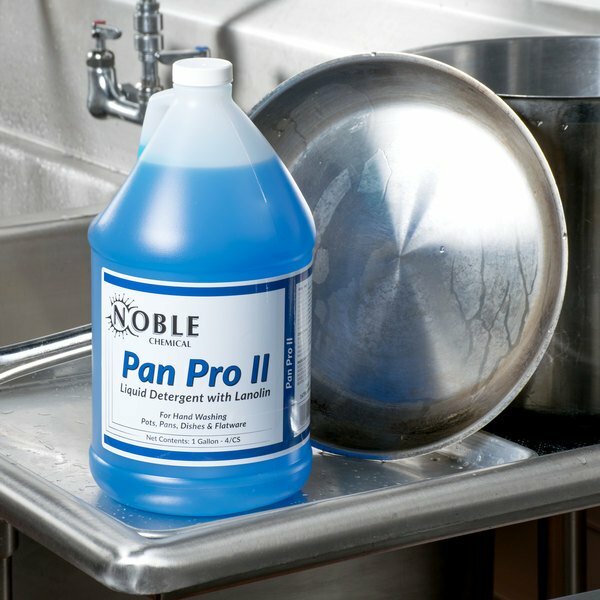 Noble Chemical Pan Pro II pot and pan detergent is the perfect choice for restaurants, healthcare facilities, schools, and other high-volume settings. This solution is for manual use and makes long-lasting suds that cut through grease, food residue, and fats for sustained cleaning power over time. 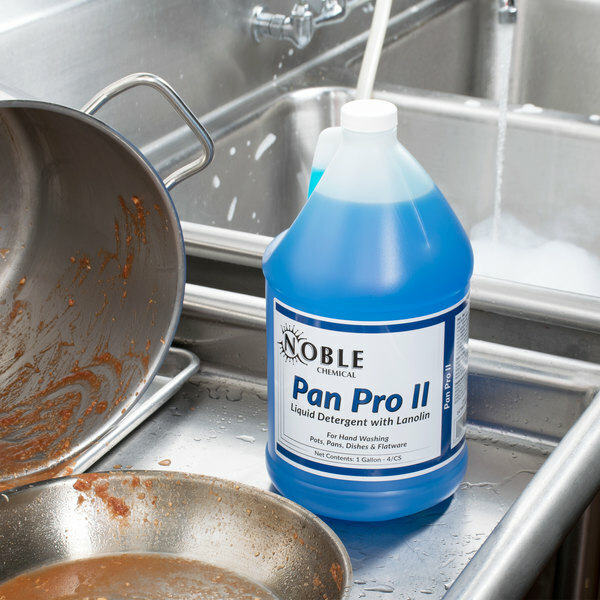 Despite this powerful formula, Pan Pro II is easy on your hands and dishes, to keep your dinnerware looking great and your staff members comfortable. Plus, it has a fresh scent that is pleasant to work with and is completely biodegradable. 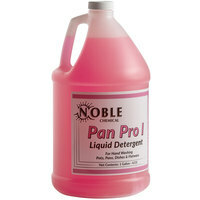 "This Noble Chemical pan pro soap is great. For the price and value it is unbeatable! It is pretty thick and not watered down like some soap i've used. Great buy and great product!" 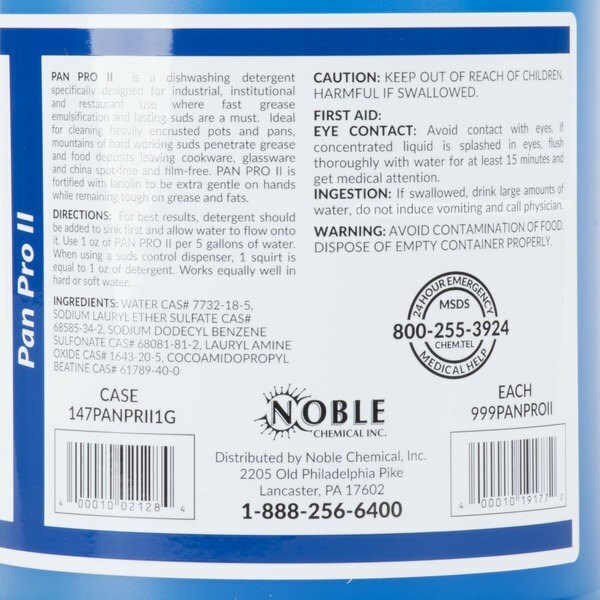 To use this Pan Pro II pot and pan soap, simply follow the instructions printed on the label. 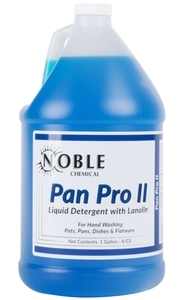 First, fill your sink with the recommended dilution of Pan Pro II by pouring the detergent in the sink and then allowing water to flow on it. 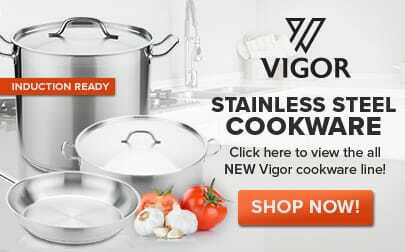 For optimal results, first scrape and remove as much solid food and waste as possible from your pot or pan. Then wash it in the diluted mixture, and rinse thoroughly in clear, hot water. You can also hook the detergent up to a suds-control dispenser for easy handling. This soap has lanolin added to prevent dry skin from occurring from long term exposure to soapy water. Lanolin is a naturally occurring oil that creates a barrier on the top of the skin that prevents moisture from escaping the hands and drying out. Formulated for restaurant, industrial, and institutional use, this pot and pan soap is perfect for high-volume establishments. 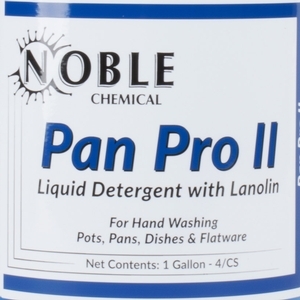 This Noble Chemical Pan Pro II pot and pan soap will quickly cut through grease, dirt, and grime, but will not harm your hands or cookware. 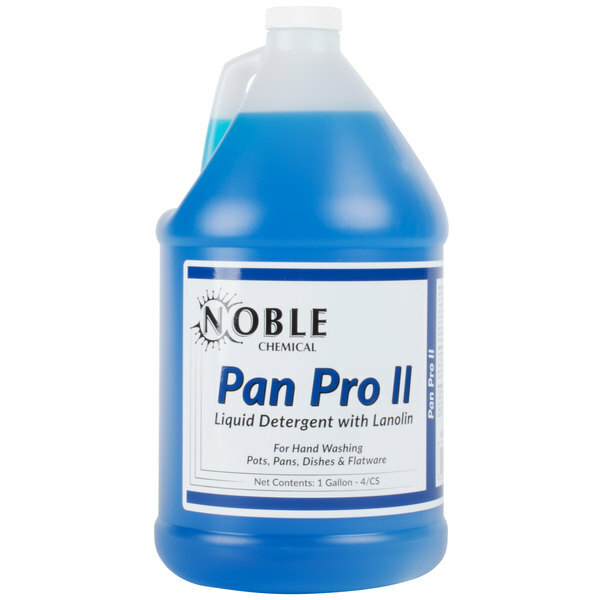 Noble Chemical brand supplies are a smart addition to any restaurant, hotel, or healthcare facility, and this tough detergent will help to keep your pots and pans spotless and ready for use. Be sure to check out our quantity discounts for even better wholesale savings! You cannot go wrong with Noble. The products are eco-friendly and they do the job as well or better than the comparable non-earth friendly brands. The price is also quite fair. Love them. 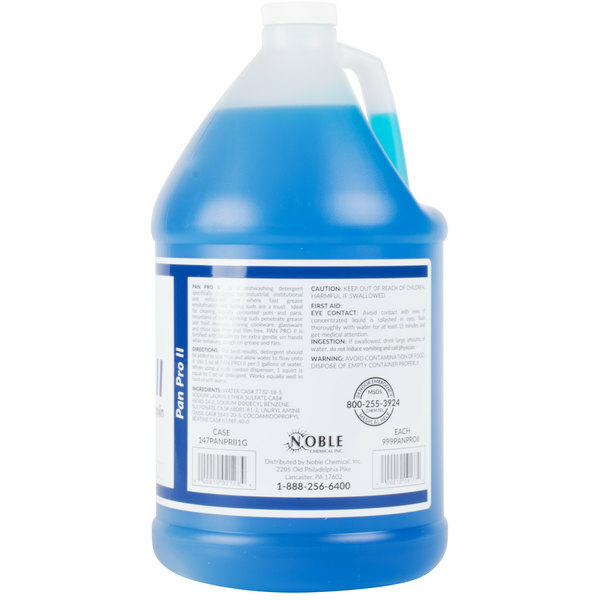 When you want clean dishes every time and great suds the I recommend using this dish soap. When we have a bad buildup on some of our dishes we just let it soak and the debris comes off. Great product. 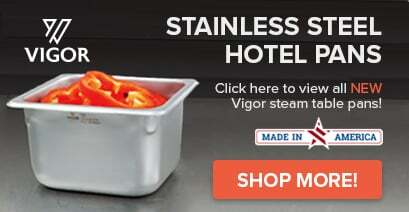 This product meets the requirements for health inspections and is affordable. Leaves our heavily used/soiled dishes clean and doesn't leave any sort of residue behind. We bought this to use in our 3 compartment sink dispenser. It appears to be more concentrate than some others and I hope it is a lot stronger than the pink dish detergent. This Noble Chemical pan pro soap is great. For the price and value it is unbeatable! It is pretty thick and not watered down like some soap i've used. Great buy and great product! 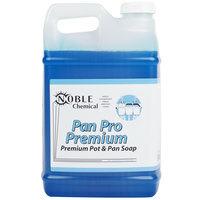 The Noble Chemical Pan Pro II 1 Gallon Pot and Pan Soap gets pots and pans clean but it seems like you have to use more than necessary to get enough suds to do this. Seams to do the job; however the soap suds disapear quickly. Perhaps I am not using enough?? To be fair I gave a 4-star since it works fairly well. 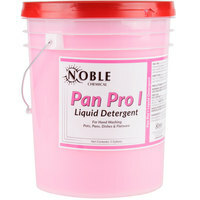 A great pot and pan soap that works great for filling up dispensers that are mounted on the wall! Good for scrubbing the floor too! !